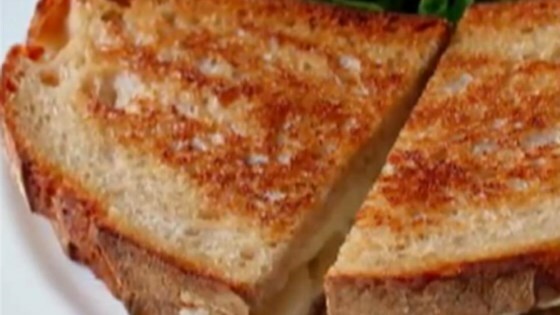 "This grilled Brie and pear sandwich is dedicated to National Grilled Cheese Sandwich Day, which happens every April 12, thanks mostly to bored food bloggers and cheese-industry marketing cartels. I'm looking at you, Wisconsin." Take the grilled cheese sandwich to two, three levels above the next level. The ultimate grilled cheese sandwich. Loved this recipe! I actually added prosciutto ham and used sourdough bread. It was amazing and my husband and 4 year old loved it as well. Wow!! What an awesome flavor combination and SO easy-peasy!! Great recipe!! I also tried it with Sourdough bread and it was da' bomb!! More grilled cheese recipes please! Awesome! I spread some fig preserves to the bread and some lingonberry jam on top of the cheese! AWESOME! Next time, i'll add some cooked bacon! Delicious!! If you can't find Brie cheese at your local grocery store, try the spreadable Crème de Brie...still makes for a great sandwich!